At the recent NASCC conference, several long-time SDS/2 customers led detailing sessions on important steel industry topics. 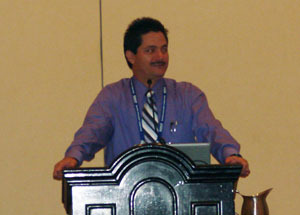 The Steel Detailers, Inc.'s Luis Torres presented a standing room only session called Connection Design: The Good, the Bad and the Ugly. The presentation centered on seven simple steps needed to achieve the final outcome of connections, including defining what types of bolts and tightening methods are required; what type of connection is called out in contract documents; and the best way to convey the finalized information. Torres also presented a session titled Engineer vs. Detailer: Where Do You Draw the Line? Thomas J. Kramer of Industrial Detailing Inc. presented a session titled Industrial Detailing 101. The presentation included an overview on girts, caged ladders and OSHA requirements, as well as a look at how stairs and handrail differ in commercial and industrial work. Following the presentation, Kramer fielded several questions from the audience on topics ranging from connection design to modular requirements and high-tech coating systems. BV Detailing & Design, Inc.'s Bruce Vaughan presented a session titled Commercial Detailing 101, which in part outlined suggested guidelines for more successfully dealing with architects: be prepared, be confident, speak clearly and explain the problem meticulously, and use RFIs, when necessary. The session also included in-depth information on technical topics such as floor openings, roof top unit supports, kickers and hung lintels.